Stellar Capital Partners is a diversified JSE listed investment holding company. The company has appointed Thunder Securitisations (Manco) as its dedicated investment manager to manage the portfolio of the company in accordance with Section 15 of the JSE Listings Requirements. The Manco, in terms of its management agreement with the company, acts on behalf of the company in sourcing, negotiating, concluding and executing investment opportunities for the company. All material investment decisions, including but not limited to the acquisition and disposal of investments, require the approval of the majority of the board of directors of the company. 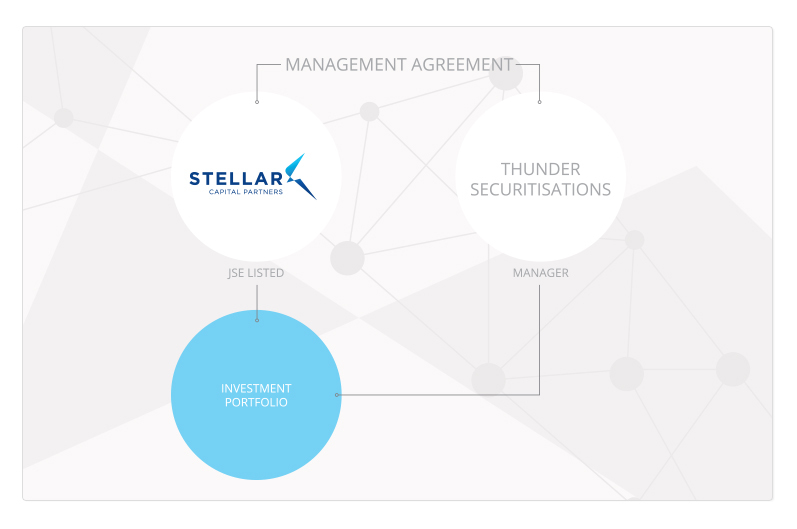 The legal structure of Stellar Capital Partners is shown below.